Q. Is it normal to get crosstalk appearing on headphones? My two sons have been reading on forums about how crosstalk appears in headphones that share a ground connection in a single cable. I gave my eldest son a pair of Grado SR125s, which have separate lead-out cables (yet which still connect to a common ground at the amplifier end), and there's zero crosstalk. I bought my other son Shure SH840s (reference grade), and they suffer some degree of crosstalk (and my own Shure SH940s fare only slightly better). I'd estimate the crosstalk to be around 40-50 dB down. I'd never heard of this issue before and thought it was nonsense! So I tried applying my knowledge of electromagnetism as best I could — thinking about inductance and 'back EMF' — but I still couldn't see how the driver that had no voltage applied across it was producing a clearly audible sound in the opposing driver. I know that most, if not all, audio circuitry creates unwanted crosstalk, and so I told my son that it would likely be the amplifying circuit to blame. Yet I was conducting this particular test using my state-of-the-art iMac and with the headphones plugged into my Apogee Duet interface. 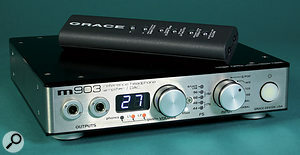 The next day I was telling my sons about how headphone amps come in greatly differing qualities, and when checking out the specifications (and price) of the Grace Design m903, noticed that it proudly boasted a 'crossfeed' feature! Do they mean crosstalk? SOS Technical Editor Hugh Robjohns replies: Yes, this crosstalk issue is well known, and many of the more up-market headphones use separate ground return wires for each ear cup specifically to avoid the problem, rather than using a shared common ground return. In other words, they typically either use a four-conductor cable instead of a three-conductor cable, or employ entirely separate cables for the left and right sides. The physics involved here is actually much simpler than you might have thought. Each conductor within the cable will inherently have a certain small resistance, and so the current flowing along those conductors to drive the transducer will inevitably generate a small voltage across their resistances. Thinking about a single transducer, what you have is a simple voltage divider. The output voltage from the headphone amp is applied across two bits of wire with a transducer connected between them. Most of the voltage will appear across the transducer, because that has the highest resistance, but some will also appear across each of the connecting wires, due to their own small resistances. Now, if we add a second transducer, but use one of the original wires as a shared common return, then the voltage seen by that second transducer is not only the voltage generated by the headphone amp (minus the small voltages lost across the connecting conductors), but also the voltage developed across the common ground conductor from the current flowing through the first transducer. The crosstalk comes from the signal voltage applied across the first transducer, which develops a small voltage across the ground return conductor, which then also appears in series with the signal voltage applied across the second transducer, and vice versa. So the crosstalk voltage is actually a mono sum of both the left and right signals, and it gets applied to both transducers in series with the wanted signal voltages from the headphone amp. The problem is inherently worse with low-impedance headphones, since the cable resistance becomes more significant compared to the transducer impedance, and thus the crosstalk voltage becomes a larger proportion of the total. Typically this crosstalk voltage will be between 30 and 50 dB lower than the wanted signal, but that won't affect stereo perception in any significant way. Gramophone pickups often barely manage 20dB separation, after all, and nobody complains much about that! However, this headphone crosstalk issue is a real phenomenon, and it can become audible if the stereo audio source has radically different signals on each channel. Some headphone amplifiers (like this Grace Design m903) have a 'crossfeed' feature that deliberately introduces crosstalk. This is designed to simulate the way in which sound from a loudspeaker reaches both our ears. Using electrically separate ground return wires helps to avoid the problem because they are connected directly to the amp's reference ground (the sleeve contact on the jack socket), and so there is no possibility of the current from one transducer generating a crosstalk voltage in the cable for the other! The same basic physics also explains the benefits of bi-wiring passive loudspeakers, by the way! Headphone crosstalk is normally entirely down to the headphone cable resistance and a shared ground return path; crosstalk between channels of modern audio electronic equipment is typically at least 70dB below the wanted signal and isn't generally audible at all. The Grace Design m903 (and many other high-end headphone amps) does have a 'crossfeed' mode, and this does deliberately introduce crosstalk. However, the crosstalk in question is carefully frequency-shaped and delayed, to simulate the way that sound from one loudspeaker reaches both ears, the amount varying with frequency (and time) due to the shape of the head. Obviously, with headphones, each ear can only hear the sound generated by the earpiece serving that ear, and that results in the typical 'sounds on a line between the ears inside the head' effect that we all know. The crossfeed system (sometimes also called HRTF processing) creates a stereo presentation on headphones that more closely emulates loudspeaker listening, by deliberately reintroducing the acoustic crosstalk that occurs in that situation. The fundamental advantage of high-end headphone amps is in their more sophisticated and powerful amplifiers, which can generate greater currents and voltages for the headphone load than typical equipment headphone drivers. The benefits are the same as those when pairing a passive speaker with a powerful amp, which always sounds much better than using a weedy amp, even when used at low listening levels.